Make bubbly links of chunky silver - eye-catching and eternal. Complete five soldered rings for the amorphous links of your bracelet using a rolling mill to create a quirky uniformity. 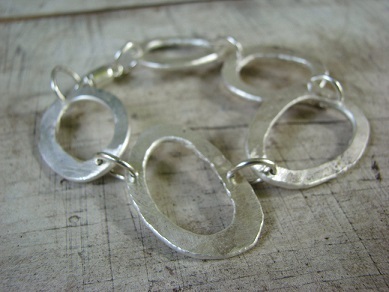 Then, create a series of jump rings to complete your bracelet formed to drape luxuriously around your wrist. Ask about adding stone setting and set a cubic zirconia gem. Materials included. Ages 18 and up. Previous solder experience neccessary.